North Korea Talks: No question, President Trump's gambit to bring North Korea's murderous dictator face-to-face at a summit negotiating table was a risky move. But after living through more than six decades of a state of war and with Pyongyang developing a nuclear weapon was worth the risk. The agreement signed on Tuesday at the Singapore summit is of course merely paper. Whether any deal survives its actual signing depends on the goodwill and trustworthiness of the participants. North Korea's Kim Jong-un, who is himself the third generation of a line of brutal dictators who routinely cheated on deals with both Democratic and Republican presidents, bears close watching. We're sure that Trump's saber-rattling rhetoric, which Democrats roundly criticized and coastal intellectual elites thought was crude, made Kim realize his real vulnerability to the U.S. military. Thus his eagerness to do a deal. 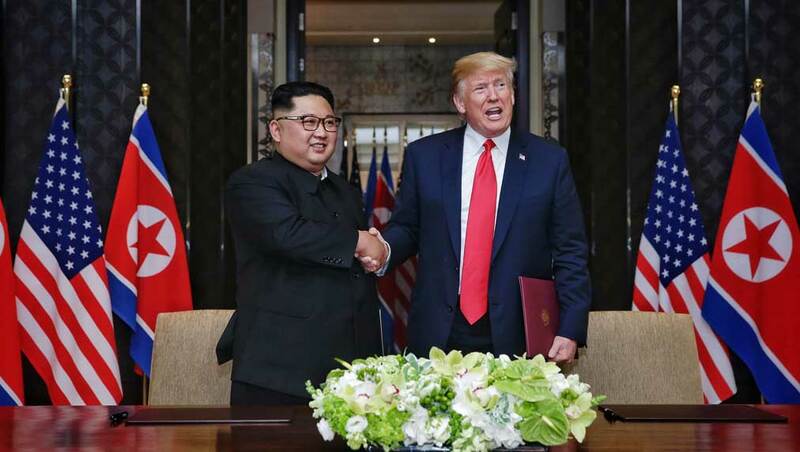 "The United States and the Democratic People's Republic of Korea (DPRK) commit to establish new US-DPRK relations in accordance with the desire of the peoples of the two countries for peace and prosperity." Yes, skepticism is always in order. But as we said this was a bold risk, one well worth taking. Kim lacks confidence these days, after Trump publicly ridiculed him, calling him "rocket man" and "short and fat" on twitter.